The poker game Texas Hold ‘Em is a fun, strategic game played with 2 or more players. 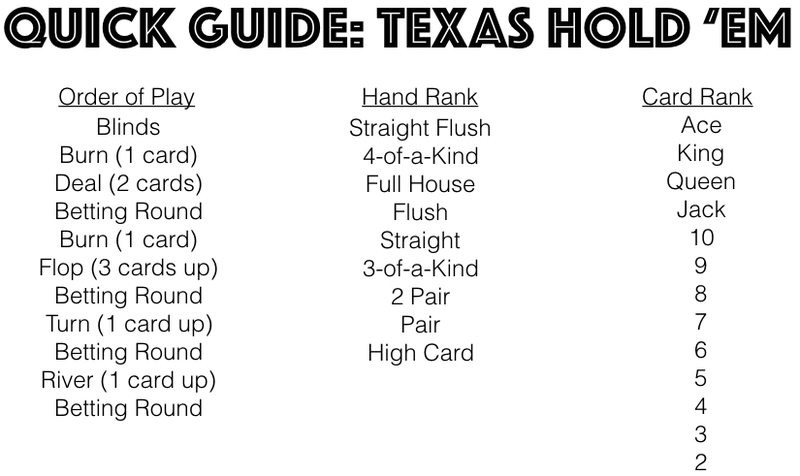 Texas Hold ‘Em is less about the cards you are dealt, and more about how you play them. Below is the video tutorial and explanation. Blinds: The player 2 spots left of the dealer has to put in the big blind (i.e. 2 chips), and the player just left of the dealer has to put in the small blind, which is half of the big blind. Deal: The dealer will place the top card from the deck face down on the table. This is known as burning a card. After a card is burned, each player is dealt 2 cards, 1 card at a time. Objective: The object of the game is to win chips. Chips are won by being the only player that did not fold, or by having the highest ranking poker hand among all the players that did not fold at the end of the hand. A poker hand consists of the best 5 cards among a player’s 2 dealt cards, and the 5 cards that will be dealt into the middle throughout the hand. Game Play: The player left of the big blind starts the first betting round. To stay in the hand, the player has to at least match the big blind. Matching a bet is known as calling. If a player does not want to bet, he/she can fold by pushing his/her 2 cards into the middle. A player has the option to raise the bet by playing more than the big blind into the middle. When play reaches the player who played the big blind, he/she has the option to raise the bet or check. A check means the player is still in the game without increasing the bet. When the first round of betting is completed, the dealer will burn one card, and flip the next 3 cards face up on the table. These 3 cards are known as the flop. Another round of betting starts with the player left of the dealer. Players have 3 options. The player could fold and be out the hand, the player could say check, meaning he/she does not want to make a bet, but will stay in the hand, or the player can add a bet into the pot. Once a bet is made, players no longer have the option to check. The betting round is over when play returns to the player who initiated the last bet/raise. When the betting round is over, the dealer will burn one card, and flip the next card face up on the table. This card is known as the turn. Another round of better starts with the first player left of the dealer that is still in the hand. When the betting round is over, the dealer will burn one card, and flip the next card face up on the table. This card is known as the river. The final round of better starts with the first player left of the dealer that is still in the hand. A player does not need to use both or any of the 2 cards dealt to him/her to create the best poker hand. If a player goes all in, a side pot can be created for the other players. For example, if a player goes all in with his last 2 chips, the next player can still bet 4 chips. 2 chips will go into the main pot, and 2 chips will go into a side pot. If the all in player wins the hand, he wins the main pot, and the second best poker hand would win the side pot. A player is out of the game when he/she is out of chips. Blinds can be increased after a certain number of deals, or when a player gets knocked out of the game.